Every old Southern homestead had a pear tree planted and many are still producing today, even long after the old homesite was abandoned. Delicious pear pies, cobblers, jellies and preserves are part of the Southern heritage. There are 3 types of pears. Hard pears, often called sand pears, have firm crunchy flesh and are best for cooking or preserves. Soft or European type pears have buttery flesh and are best for fresh eating. Asian pears are round with sweet, crisp flesh and excellent flavor and are also eaten fresh. Pears can be stored in the refrigerator for months. Like apples and peaches, pears require chilling to produce fruit. Pears are easy to grow. They produce a beautiful ornamental display of white flowers in the spring. Some varieties are susceptible to fire-blight and leaf spot. 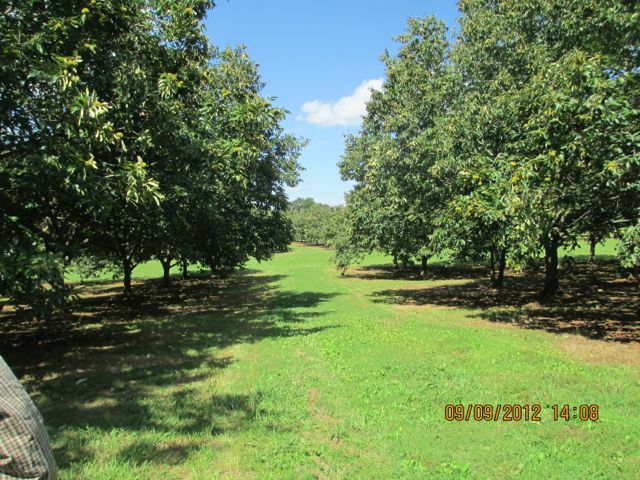 Well-drained sandy loam soils are preferred, but pears will grow on many soil types if good drainage is provided. Pears will grow more vigorously and produce more fruit in full sun. Avoid frost pockets- pears may be damaged by unseasonable frosts. Prepare the area by removing any weeds prior to planting. This step is often over looked but is absolutely critical to any successful planting. Weeds and grass steal light, water and nutrients from your trees. Pears prefer slightly acid soil (pH 5.9-6.5). Dig a planting hole approximately two times the width of the pot and at the same depth as the root ball. Set that soil aside and mix it 50/50 with either aged compost or aged manure. Remove the plant from the pot, gently loosen the root ball and place in the planting hole. Set the tree in the middle of the hole. Using some soil, secure the tree in a straight position. To avoid burying too deep, make sure plant is positioned with the top most roots at the soil line. Fill the planting hole with the native soil and mixed soil with organic matter; gently tamp it in. We recommend creating a water-holding basin around the hole and water the trees in thoroughly at planting. Remove the berm at the end of the second growing season. Water slowly at the drip-line. Water in thoroughly, making sure there are no air pockets around the roots. Air pockets prevent roots from growing into the soil around it. After the water has soaked in, spread a protective layer of mulch 2-4" deep around the trunk pulling the mulch a few inches away from the trunk to keep the moisture from accumulating next to the bark. Choices for mulch, leaf litter, hay, shredded or fine bark, pine needles. Do NOT put fertilizer in the planting hole. Only apply fertilizer if it is the correct time of year. Spacing for pears depends upon the desired use in the landscape. Trees should be at least 15 feet apart. Place pears requiring cross-pollination no further than 25 feet apart. The type of fertilizer you choose may be chemical or organic. Make sure that the fertilizer contains iron, zinc, manganese, magnesium, molybdenum, copper and boron. These minor elements are very important to plants and most soils very important to plants and most soils are low in these elements. You can use Espoma Citrus Tone. Spread the fertilizer evenly under the entire canopy of the plant avoiding a 5-inch area around the trunk. Water or rake in. For Zones 8a-10, fertilize 3 times each year in late March after bud break, late May and late July. For plants further north (Zones 6-7), fertilize in March after bud break. Never fertilize after August (June in Zones 6-7) as this will promote new growth late in the year which will be subject to freeze damage. Excess Fertilizer or pruning stimulates too much vegetative growth, promoting fireblight. If trees need to be pruned heavily (as for an older tree that needs rejuvenating), don’t fertilize for a year or two. The first year is a critical time for the establishment of a new pear. Soak the entire root system deeply – this usually takes 40-50 minutes. Pears should receive at least 1 inch of water each week for best growth and fruit productions. Water regularly, especially during dry periods. Fruit may drop prematurely if insufficiently irrigated during dry spells. Keep an area approximately 4 feet in diameter around the pear clear of grass and weeds to minimize competition for water and nutrients. The pear’s natural tendency is to grow upright, creating narrow crotches that tend to break under heavy fruit loads. To avoid this, early training is a must. At planting select 3-4 scaffold branches spaced equally around the trunk and remove other branches flush with the trunk. You want the tree to have good air circulation in the interior. Mature trees are pruned during the dormant season. Thin out branches and head back long shoots as needed to maintain trees height. Remove water sprouts. Un pruned tree will tend to be bushy, lack vigor and produce small, inferior quality pears. Remove any dead, damaged or diseased branches when pruning. Head trees back with mold and hold cuts to maintain height for ease of picking. To avoid the spread of fireblight, prune any blackened shoots as they appear. Cut at least eight inches below the area, being careful to sterilize your pruning shears between cuts with bleach solutions to avoid spreading the disease. Collect and burn infected limbs. Fabraea leaf spot Other common diseases that damage pear trees include Fabraea leaf spot, caused by the fungus Fabraea maculate. Keep a look out for dark spots on leaves that then yellow and fall. Cankers appear on fruits too, and cause them to crack. Again, sanitation is essential to controlling this disease. Removal and disposal of all fallen leaves significantly reduces the chance that your pears will get leaf spot. Fungicide spray can also help control the disease. Bears: July-August in 3-5 years. Varies by varieties. Item #: Orient Pear - Very large, yellow fruit with a red blush. Hardy, good for canning and baking. Ripens during hunting season Sep-Oct. Item #: Pineapple Pear - A hard pear, that bears heavy crops of large, tangy pineapple-like flavored fruit - good for cooking, canning or fresh eating.